Kampanj: Nygammal strategi för Hillary Clinton! USA | Hillary Clintons förra försök att bli demokraternas presidentkandidat kan sammanfattas i ett par paradoxer. Ingen kan förneka att Clinton alltid omger sig av kompetenta och lojala medarbetare. Trots detta var hennes kampanjstab ständigt i luven på varandra senast Clinton försökte bli demokraternas presidentkandidat. Den andra paradoxen är att Clinton – som utmålades som kompetent och erfaren – inte ens var kapabel att avstyra detta inbördeskrig. Nu förslår Joshua Green i Bloomberg Businessweek en variant av den strategi som fick skulden för valförlusten mot Barack Obama. Det huvudsakliga budskapet då var att Clinton var en kompetent ”Iron Lady” med erfarenhet. Om Clinton vunnit hade strategin säkert uppfattats som både briljant och självklar. All the careful planning and creative imagery—the upbeat video, the Iowa road trip—intended to distinguish Clinton from the candidate who ran last time, won’t matter if she hasn’t realized that her own shortcomings are what doomed her. In the end, she’s the only one with plausible authority to direct her own campaign. And the best way to assert control of her new operation would be for her to develop what was so sorely missing last time—a clear, overarching justification for her candidacy. The best rationale for Clinton 2016 is the same one embedded in the attacks Republicans are already making: that she’s a creature of Washington who embodies the past, and that it’s time for a new face and an outsider. Clinton can’t avoid this critique. 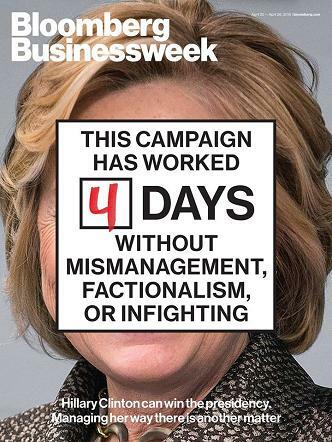 But she can subvert it by presenting her two decades in the White House, Senate, and State Department as experience that’s left her uniquely equipped to do what polls say Americans are pining for: Make Washington function better. Clinton has always been called a “polarizing” figure (an increasingly meaningless designation that applies to every national politician, as voters have become more partisan). But she has an underappreciated credential that could be a weapon in the upcoming race: a record of thriving in an acrimonious, Republican-dominated climate like the one we have now. As voters begin contemplating who should become the next president, Clinton can, if she chooses, make the strongest claim that she’s best suited to manage in the deteriorating conditions in Washington. How much will that matter? Probably more than at any time in the recent past. Beneath Americans’ intensely negative feelings toward Washington, and Congress in particular, lies an appreciation that the job of making the government function effectively will require more than just a new occupant in the Oval Office. 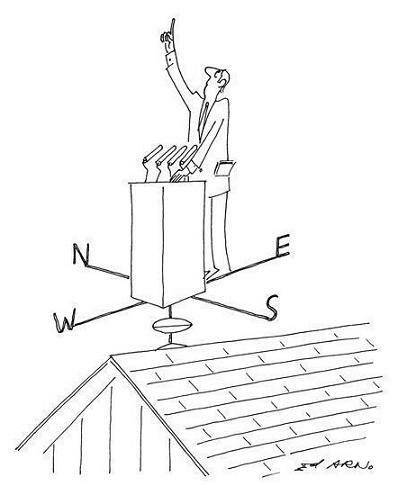 A Washington Post-ABC News poll last month found that more Americans desire “experience” (55 percent) than “a new direction” (37 percent) in a presidential candidate. Clinton’s old line about her readiness to “do the job from Day One” may be more compelling this time around. A steady majority of Americans continue to tell pollsters that they want compromise from Washington. Here, too, Clinton may have hidden appeal. A recent Pew Research poll found they believe by a 4-to-1 margin that women are better at working out compromises than men. It would be no small irony if the exhaustion with partisanship that these numbers show turned out to be a positive, rather than a negative, force for Hillary Clinton. Of course, the prerequisite to any claim that she can make Washington function more effectively is that Clinton first pass the test she failed before—and run a professional campaign. Tidskriftsomslag: Bloomberg Businessweek, 20-26 april 2015. Böcker: Om Putins auktoritära kleptokrati! RYSSLAND | Bill Browders bok om korruption och maktövergrepp inom den ryska affärsvärlden under Vladimir Putins styre har kommit ut på svenska. 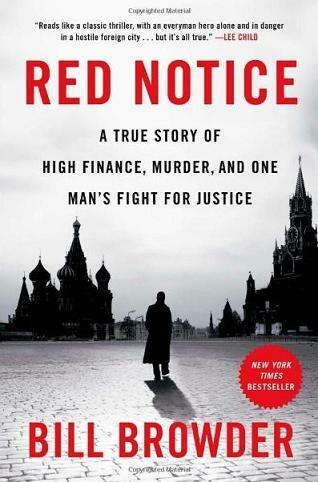 Red Notice: A True Story of High Finance, Murder, and One Man’s Fight for Justice har på svenska fått namnet Mitt krig mot Putin: den sanna historien om stora pengar, mord och en mans kamp för rättvisa. Bill Browder may be Russian President Vladimir Putin’s No. 1 foe. For the past several years the CEO of Hermitage Capital Management has led an international campaign to expose deep corruption and human-rights abuses in Putin’s Russia. His efforts culminated with Congress’s 2012 passage of the Magnitsky Act, which forbids gross abusers of human rights in Russia from banking in or visiting the U.S. It’s named after Browder’s lawyer Sergei Magnitsky, a whistle-blower who was murdered in a Moscow prison in 2009 after uncovering massive Russian government fraud. Before he became an unlikely human-rights activist, Browder was for a time one of the largest foreign investors in Russia. In the tumultuous years following the fall of the Soviet Union, he made a fortune for himself and his clients by confronting some of the country’s corrupt oligarchs. But in Russia, shareholder activism could be dangerous work, as Browder explains in this excerpt from his new book Red Notice: A True Story of High Finance, Murder and One Man’s Search for Justice. Läs mer: “The fallen idol: seeing Putin in a new light” är A. D. Millers recension av Browders bok i The Spectator. USA | Demokraternas primärval ser ut att bli ett riktigt sömnpiller om ingen tungviktare vill konkurrera mot Hillary Clinton. Vad som skulle kunna sätta stop för hennes försök att bli president är om väljarna inte känner för att rösta på ännu en Clinton. Liknande problem har Jeb Bush på den republikanska kanten. Möjligheten att Clinton kan bli den första kvinnan i Vita huset kommer naturligtvis generera nyheter framöver. Frågan är om det räcker. Kanske är tanken på en kvinna i Vita huset inte längre lika spännande sedan USA redan har valt sin första svarta president. Ingen tror längre att en kvinna inte kan bli president. Dessutom är Clintons politiska åsikter inte direkt kristallklara. Det är i och för sig inget ovanligt. Vaghet används nämligen ofta som strategi för att minimera risken att bli en måltavla för motståndare. Men om Clinton inte ens kan artikulera en tilltalande vision för USA finns det inte heller någon anledning att rösta på henne bara för att hon är kvinna. Och när hon väl uttrycker några politiska åsikter låter det som … Bill Clinton. Candidates usually take sharply ideological positions during primaries, to woo the die-hard activists who vote in them, before tacking back to the centre as the general election nears. However, if Mrs Clinton faces no real primary challenger, she may not need to do this. Instead, she will need to woo enough Democrats to build a sense of excitement and grassroots involvement, without alienating swing voters. And if she cannot achieve the same stellar levels of support among black and young voters that Mr Obama did, she will need to fill the gap some other way. She has made her pitch to women clear. She stresses her desire to help more of them into the workforce. She solemnly declares that women should receive equal pay for the same work as men (a position with which no one disagrees). In the past she has campaigned to make it easier for women to sue over alleged discrimination. A big test involves white voters without a college education, who make up about a third of the electorate, but have drifted from the Democrats since Bill Clinton’s day. Mr Obama only won 36% of their votes in 2012, and might have done still worse if he had not successfully painted his Republican opponent, Mitt Romney, as their worst nightmare of a boss. Should Mrs Clinton win the general election, she will also need to be ready on Day One to deal with Republicans. There is virtually no chance that Democrats will win the House of Representatives in 2016, and even if they retake the Senate they will not have a filibuster-proof majority. Expect Mrs Clinton to run to Mr Obama’s right on foreign policy. In interviews since leaving the State Department she has said that she urged him to take a muscular approach to Russia. She has chided Europeans for failing to stand up to Vladimir Putin (she wants them to send arms to Ukraine, for example), while crediting the reset with achieving at least one arms-control agreement and securing Russian help in talks to curb Iran’s nuclear ambitions. She has called the latest draft deal with Iran, brokered by America and other world powers, an “important step”, whatever that means. Last year she signalled that she would be more comfortable with stricter curbs on Iran’s nuclear programme. In a rare overt criticism of Mr Obama, she said in 2014 that the failure to help non-Islamist Syrian rebels fight against Bashar Assad had left a “big vacuum” for Islamic State and other jihadists to fill. Mrs Clinton has come close to echoing Republican grumbles that Mr Obama is too apologetic about American power. She says that her country cannot solve all problems, “but there’s not a problem that we face that can be solved without the United States.” While ruling out a return to the hubris of the George W. Bush years, she hints that the time has come for America to re-engage with the world. In domestic forums Mrs Clinton is fluent in the language of the modern business-friendly centre-left. She is keen on public infrastructure, universal education for the youngest children, lowering the cost of college and experimenting with German-style wage-subsidies for the working poor. She likes to see church groups working alongside strong trade unions and community organisations, and uses “evidence-based” as high praise for any policy. In 2008 she sometimes sounded like a deficit hawk, with slogans like: “We’ve got to stop spending money we don’t have.” In 2008 she also called for a “time out” on new trade deals, though as secretary of state she backed new pacts. During primary debates she called herself “committed to making sure Social Security is solvent” and said that the best route to reform lay through bipartisan compromise. 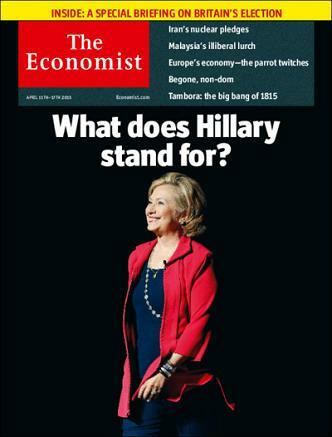 Läs mer: ”What does Hillary stand for?”, ledare i The Economist. Tidskriftsomslag: The Economist den 11-17 april 2015. Kampanj: Valet som blir utan vinnare? VAL 2015 | Inte för att det märks i svensk media men nästa månad går Storbritannien till val. 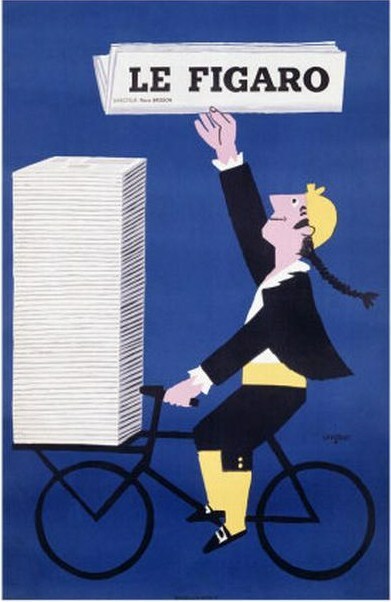 Trots att det förväntas bli en strid på kniven har vare sig partiledarna eller de etablerade partierna direkt imponerat så här långt. Bilden på ovan säger allt om hur David Cameron, Ed Miliband och Nick Clegg uppfattas ha förvaltat sin tid vid makten alternativt i opposition. Conservative Party borde vid det här laget knappat in betydligt mer på Labour än vad man gjort. Och till skillnad från de andra partiledarna är Miliband mer ett ankare än en tillgång för Labour. Liberal Democrats har i och med sin medverkan i regeringskoalitionen inte längre fördel av att kunna välja och vraka vad man skall ta ansvar för. Med regeringsmakten följer ansvar även för mindre populära beslut. Även det parti som vinner förväntas göra det med så små marginaler att det kommer att kräva ännu en koalition för att kunna skapa en stabil regering. Och koalitioner är inget man i uppskattar i landet. Cameron is busy prophesying economic chaos if Labour wins; Miliband is warning that the NHS won’t survive in its current form if the Tories get back in. Nick Clegg, meanwhile, is volunteering to be either the Tories’ heart or Labour’s spine — and stressing that he’s not picky about which. He can’t afford to be. His party could lose half its seats. Whoever ends up in Downing Street in May will be the weakest prime minister in living memory. They will be forced to implement the most difficult half of the austerity programme with a slim to nonexistent parliamentary majority at a time when traditional party discipline is breaking down in the House of Commons. 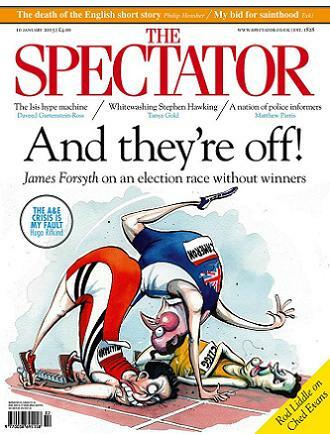 Tidskriftsomslag: The Spectator, 10 januari 2015. Kampanj: Jeb Bush och familjearvet! USA | Jeb Bush är det vuxna alternativet bland de republikaner som nu har tillkännagett sitt intresse för att bli partiets presidentkandidat. Men är amerikanarna redo för ännu en Bush i Vita huset? Och kommer en framgångsrik valstrategi kräva att han distanserar sig från sin bror? Kritik om att han inte skiljer sig nämnvärt från den politik hans bror George W. Bush stod för kommer garanterat dyka upp från utmanare, både inom partiet och från demokraterna. Alex Altman och Zeke J. Miller i Time har tecknat bilden av en politiker med både enorma resurser men också mycket historiskt bagage. 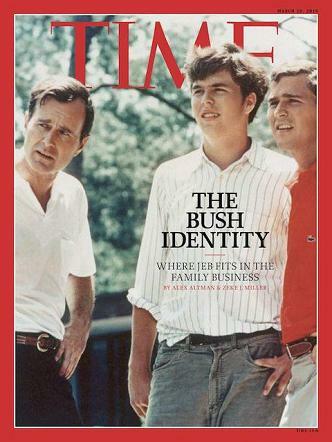 Jeb has always been more substance than style, a technocrat who doesn’t often display his brother’s gift for gab. “He doesn’t like the backslapping of politics,” says T. Willard Fair, the CEO of the Miami Urban League and a longtime friend who teamed with Bush to build Florida’s charter-school network. “If you could put him in the corner with a book, he’d rather do that.” Even close friends say he doesn’t kibitz much, charging through pleasantries on the phone to cut to the heart of the matter. But he has mastered the niceties that count in campaigns, like entering donors’ numbers into his personal cell phone so he can greet them warmly when they call. For a politician who operates as a soloist, Bush has built an ensemble of allies with rare devotion. The ardor was clear on a Tuesday afternoon in mid-February, when 300 longtime supporters showed up at a Tallahassee hotel with a view of the state capitol for a fundraiser to benefit Bush’s super PAC. Lobbyists and former aides wearing circular red jeb! ’16 stickers on their chests scribbled out checks on tall cocktail tables as they waited to enter a ballroom with baubly glass chandeliers. “There are a lot of us who would do almost anything for him,” says former Bush political director David Hart, pulling from his pocket an index-card-size printout detailing the state’s education gains since Bush took office. The 43rd President’s biography of the 41st, coupled with a hagiographic HBO documentary, formed the core of a quiet campaign to stoke nostalgia for the first Bush presidency and thaw opposition to a third. At the same time, Obama’s struggles to tame Islamic extremism refired the Restoration instincts in Republican politics. By June 2014, George W. Bush’s approval rating trumped Obama’s in Gallup polling, breaking the 50% threshold for the first time in nearly a decade. And so a year ago, Bush asked his top political advisers to map out a role in the 2014 midterms with an eye toward a possible presidential run. As he campaigned for Republican candidates, he met privately with policy bigwigs. He had his fundraisers gin up cash for key governors, always a good way to test the waters around the country. As his team sees it, Bush has four main weaknesses among primary voters. He is a longtime champion of comprehensive immigration reform in a party suspicious of amnesty. He supports Common Core education standards, which have emerged as a grassroots bugbear. His refusal to sign antitax pledges calls up for skeptics the “read my lips” promise broken by his father, and his recent statement that conservatives should respect gay couples who marry made social conservatives skittish. Then there are the liabilities of his lineage. The conservative base came to regard George W. Bush as a Big Government Republican, a profligate spender who ran up big deficits, passed now-unpopular policies like No Child Left Behind and Medicare Part D and presided during the greatest economic crash since the Depression. Many presume Jeb is much the same. And polls and party operatives agree that in the coming battle against Clinton, the party would benefit from a fresh face. Few people outside Florida know much about Jeb, and his advisers acknowledge that the campaign’s success may hinge on its ability to distinguish the new family man from the Bushes who have preceded him. (It is no accident that the candidate’s signage and swag don’t include his last name.) But at some point this may require a public break from his brother. Jeb–who supported George W.’s wars and has argued that Obama’s troop withdrawal paved the way for the rise of the Islamic State of Iraq and Greater Syria (ISIS)–gently conceded during a recent appearance in Chicago that his brother had also made mistakes in Iraq. But the muscular foreign policy vision he laid out left audiences wondering exactly how his approach would differ. Tidskriftsomslag: Time, 16 mars 2015.